CardLayout manager is used to position the components in a manner of deck of cards, with only the card at the top of deck is visible at a time. All the components of CardLayout Manager are of the type - JPanel and they are contained in a main parent JPanel container. 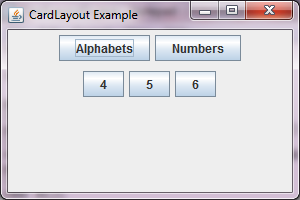 The layout manager of this main parent JPanel is set to CardLayout manager. public CardLayout() Creates a CardLayout with gap of size zero between the components..
public CardLayout(int hGap, int vGap) Creates a CardLayout with a specified number of gap between the components. public void first(Component comp) This method flips to the first card in the container. public void next(Component comp) This method flips to the next card in the container. public void last(Component comp) This method flips to the last card in the container. public void show(Component comp,String name) This method shows a specific card in the container with a specific name. public void setHgap(int horizontalGap) This method sets the horizontal space between components. public void setVgap(int verticalGap) This method sets the vertical space between components. LayoutManager is an interface which is implemented by CardLayout manager class. An example display the use of CardLayout Manager. A parent JPanel which further contains two child JPanel. //Setting container JFrame's layout to FlowLayout. //If "Numbers" button is clicked, open the JPanel with buttons showing numbers. //If "Alphabets" button is clicked, open the JPanel with buttons showing alphabets. We have created a JFrame that will hold a parent JPanel and two buttons Alphabets and Numbers. This parents JPanel will contain two child JPanel named childPanel1 and childPanel2. JPanel childPanel1 will hold three buttons, each displaying a number. JPanel childPanel2 will hold three alphabets, each displaying an alphabet. When you run the code, you are presented a window showing the main frame, which contains a parent Panel which further contains two child panels, which looks like Figure1. When you click on the button Alphabets you are presented a JPanel with buttons showing you Alphabets, like Figure2. When you click on the button Numbers you are presented a JPanel with buttons showing you numbers, like Figure3.